The Indian Patent Office (IPO) is the authority designated in the Patents Act, 1970 to review applications for and grant patents. While the IPO cannot make law regarding patents – that is generally speaking, the function of Parliament – the role it plays in regulating the IP system in the country is critical. Following demands for the IPO to codify its practices, the authority released a draft Manual of Patent Office Practice and Procedure in 2009. Following a process of public comment and revision, the Manual was finalized in 2011. The Manual is important as it lays out the way in which the Patent Office will scrutinize patent applications – in order to see whether an innovation is fit for patenting or not. The Manual is supposed to bring consistency and uniformity to the methods followed by the patent examiners and also enhances transparency in their functioning. In 2013, the IPO released a set of draft Guidelines pertaining to how the authority would examine inventions related to computers. These draft Guidelines broadly followed the scope of the parent legislation – the Patents Act – which contains specific provisions that proscribe the patenting of algorithms, business methods, mathematical methods and computer programmes ‘per se’. Following various rounds of meetings with stakeholders (which include representatives of industry as well as civil society, including the Society for Knowledge Commons), the IPO issued its final Guidelines on Computer Related Inventions in August 2015 (the CRI Guidelines). These Guidelines were to replace the existing provisions in the Manual when it came to the examination of computer related inventions. The Indian Patent Act, 1970, in Section 3, lists various artifacts that are not deemed to be inventions and therefore not capable of being granted a patent. Amongst the proscribed inventions are, in sub-section (k), “a mathematical or business method or a computer program per se or algorithms”. Accordingly, Section 3(k) is on the face of it, fairly clear in explicitly ruling out mathematical and business methods and algorithms, in any form, from the scope of patenting. Further, computer programs (software) “per se” cannot be granted a patent. The CRI Guidelines when finally notified in August 2015, however, went against the letter and sprit of the statute and sought to expand the scope of patenting available to mathematical and business methods, algorithms and software. The CRI Guidelines state that if a patent application specifies an apparatus in connection with or a technical process for carrying out a business method or demonstrates a practical application for a mathematical method, it can be considered an invention (i.e. could be the subject of patenting if it meets the other tests of patentability). This, however, clearly violates the letter and spirit of Section 3(k) of the Patents Act. In so far as software patents are concerned, the CRI Guidelines misinterpreted legislative history of the Patents Act (and section 3(k) in particular) and stated that a patent should not be denied if a claim directed primarily at software also establishes industrial applicability of the invention. The CRI Guidelines also permitted patents to be granted where a claim showed novel software in combination with known hardware that goes beyond the normal interaction with that hardware and that affects a change in functionality of the hardware. This interpretation of Section 3(k) basically ignored the fact that in its 2005 amendment to the Patent Act, Parliament specifically rejected proposed amendments to Section 3(k) that would have the effect of further narrowing the exception created by the section (thereby increasing the scope of patenting software). Parliament specifically rejected proposals to permit software to be patented when industrial or technical application was demonstrated or when in a combination with hardware. What these changes mean is that merely by strapping a hardware device onto a new or novel software, the applicant could get a patent. Similarly with a mathematical method or business method – mere addition of a hardware component could see a patent granted. Following the notification of the CRI Guidelines by the IPO, various civil society organizations, members of academia as well as various representatives of the tech- industry, came together to start a campaign to seek revision of the CRI Guidelines. We petitioned the patent office, the Prime Minister of India, and sought to draw public attention to the issue using both traditional and new media. Following our interventions, the Patent Office has decided to keep the CRI Guidelines in abeyance pending further discussions. We are currently involved in meetings with the IPO to draft a fresh set of Guidelines that will actually follow the letter and spirit of the Patents Act. [ii] Scholars Christina Mulligan and Timothy B. Lee estimated that it would take roughly 2,000,000 patent attorneys working full-time to compare every software-producing firm’s products with every software patent issued in a given year (in the US). Mulligan and Lee estimate that this would cost the U.S. economy $400 billion a year. In reality, the costs would likely be far greater, since these scholars guesstimated the average cost of a patent attorney as being $100 an hour, when in fact it is now much higher. The American Intellectual Property Law Association (AIPLA) estimates the mean cost of a patent attorney or patent agent as being $371 an hour in 2011. Using AIPLA’s hourly mean, it would cost approximately $1.5 trillion a year to screen every software program against software patents issued just that year (and that is assuming it only takes 10 minutes to clear an individual patent). Put another way, conducting thorough software patent clearances would consume — at a minimum — 10% of the U.S. GDP (and perhaps considerably more). This exceeds the value-add that the nation’s information industries, (software, publishing, data processing, telecommunications) provide to U.S. GDP in the first place. In fact, it is nearly 2.5 times the amount of money spent by the U.S. Government on national defense in 2012. Thirty groups from around the world, including the Society for Knowledge Commons, have penned an open letter to Mark Zuckerberg regarding Facebook’s recent actions concerning the Free Basics program in India. The letter urges Facebook to meaningfully and respectfully engage with Net Neutrality advocates who are fighting for a free and open internet across the globe. 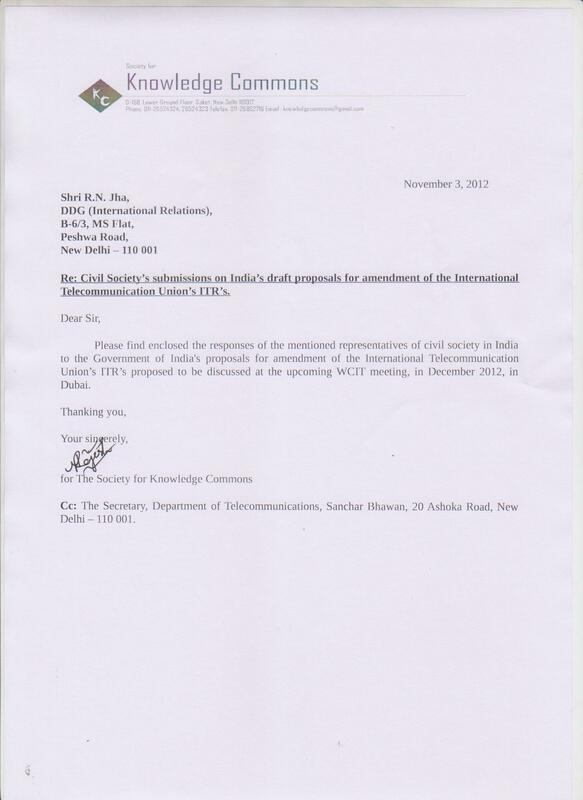 KC was part of a group of civil society organisations that commented on the Indian government position at the ITU’s World Conference on Information Technology held in Dubai in 2012 to discuss framing new International Telecomunication Regulations.